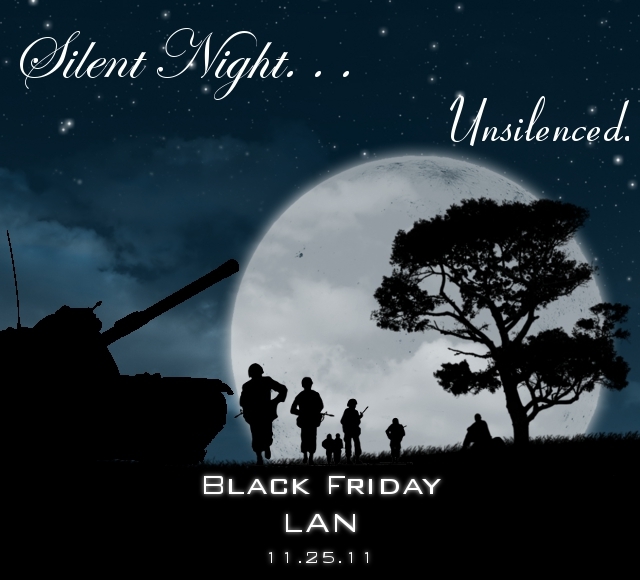 For the past 4 years now I've been hosting small LAN parties with groups of friends from around the neighborhood. These LAN parties typically have anywhere between 4 and 10 fellow gamers. 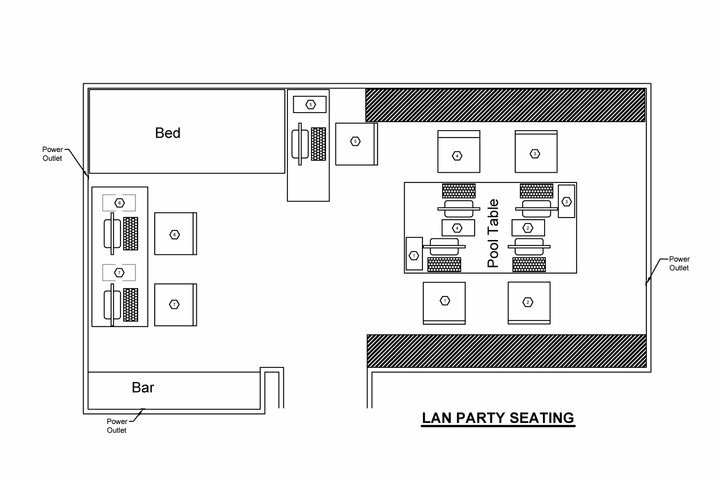 Not big by typical LAN party standards, hence the reason why I call them MicroLANs. MicroLANs are a fun way to get together and play the same online games you'd play by yourself, but with others. Because honestly, how much better is it after winning a game that you get to bask in the glorious hatred of the fellow players who are in the same room as you? A lot better (trust me). This is why I've been hosting MicroLANs for the past few years now. I've typically hosted a MicroLAN twice a year. Once during the summer, and another during the Thanksgiving holiday weekend. In a few days I'll be hosting another one, which has prompted me to write about it. Hopefully following these few guidelines can help you start a MicroLAN party in your basement sometime soon. Typically, the preparation for a MicroLAN has the basic preparation of any event. Who, What, When, Where, and Why. But for MicroLANs there's an extra bit of Equipment that should be added to the list. There's no point in attempting to host an event you don't have the equipment to host it with. This will give you a quick over view of all the preparation you should look to do before your MicroLAN. This is probably the second easiest part of the list. Who are the people who are going to show up and play games with you. They're the n00bs you're going to frag. The biggest problem with the Who part is that they're affected by the subsequent When and Equipment parts of the preparation. This IS the easiest part of the list. If you don't know what you're doing, then let me remind you. It's a MicroLAN party. Where you'll have lots of fun. Remember now? Good. Let's move on. When is probably the most difficult part of the entire ordeal. Because you're hosting a MicroLAN, every person who attends makes a big difference. There's a big difference between a 6 person LAN and a 5 person LAN. My advice is to plan the event a month or two in advance. That way people have time to negotiate schedules and ask for time off if they're interested. Try to set a date in stone. Don't move it around because people then get confused or aggravated. If you can, take a general consensus for when people are going to be available. No point in planing it if 3 or 4 people are on vacation that weekend. In my experience, the more time, the better. You don't have to, but I enjoy creating "flyers" like the one below for the MicroLAN to post on social networking sites in order to attract attention. Another difficult question. 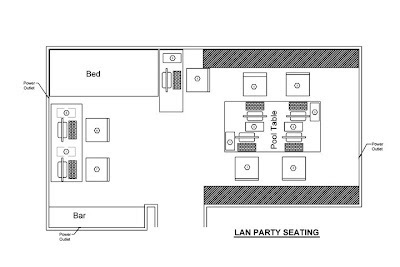 MicroLANs take up a lot of space, so finding a venue with enough room for people might become challenging. Try to keep everyone consolidated in the the same room. If you're playing against someone in another room, you might as well be playing with them over the internet. Being in the same room together, getting to yell at your friend who's sitting next to you, getting to hear your little brother scream expletives as his space ship crashes, this is what makes a MicroLAN more than just gaming. It's nice to find a venue with enough tables, chairs, and power outlets. The latter is extremely important, so you don't end up daisy chaining power strips together. That was a mistake I won't be making again. It's also important to have easy access to internet. Below is a layout used to for a medium size MicroLAN. The room was 20ft x 10ft. An age old philosophical question which I will not attempt to answer here. Another big factor in hosting a MicroLAN is the equipment. By this I mean your networking equipment, your gaming equipment, and your guest's gaming equipment. First let's talk about networking equipment. For a small MicroLAN, you can probably get away with using your good old router at home. But for bigger ones (>4 people) you might want to start looking into buying a switch and some ethernet cables. With everyone wired into a switch, games lag less. This is particularly important if a lot of your friends bring laptops. They should still hardwire themselves into the switch because WiFi is slower than ethernet (depending on what type of WiFi i must say). Also, the more people using WiFi, the slower the WiFi becomes. It's quite conceivable that you and your friends all have different types of computers and different level of graphics/gaming capabilities. This starts to become a problem when some people want to play the latest Maul of Duty game and some people can barely run Internet Explorer. I have not found the cure to this problem yet. We still play games published earlier than '05 mostly but we will run into a problem with who can play what. Just be warned of what could happen when people show up with their eMachine from '02. Building a gaming computer doesn't cost an arm and a leg if you want to get by and just play the game and could be spared the 1080 melt-your-mind-mode that a lot of games are coming with today. I just built a computer for my little brother for $304.95 (including OS).